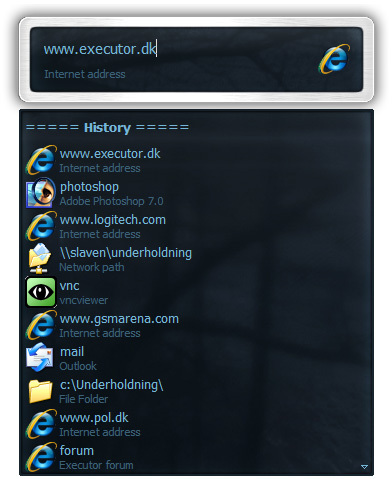 Executor is a multi purpose launcher sporting many optional customizable features and advanced setup. The program originated as I was sick of spending too much time searching for programs through my ever growing windows start-menu, and eye-balling desktop trying to mouse locate what ever I wanted to launch. Also I missed a tool that could ease and optimize my daily work flow. There was of course already programs like this available, but each had it's annoyance or missing features or too(!) geeky. Url detection, Enter URLs directly (like www.google.com, mail.google.com, google.com or http://www.google.com). Ability to add your own paths to scan for user defined file extensions. Keyword "find [text]" for using Windows Instant Search feature or Windows Desktop Search. Can add keyword integration with popular services like GMail, Twitter, GCal, RTM and many others (see forums for howto's, tutorials and tips). Optional list displaying matching items. Skinable. Supporting alpha blending effects and free positioning of all elements. Each keyword have properties like optional group (to organize into groups), customizable icon and other properties. Can auto import keywords from an url on startup, so you can share keywords between different Executor installations (for example for cooperate use). Executor has a number settings on how you want it to find desired item(s). Text could "start with" or "contain text" (substring) or short form detection (for example typing ffox for firefox). Keywords to manipulate the current active window (center, resize to specific size, maximize width or height etc). Special keywords to list (and open) running applications, text previously copied to clipboard and recent documents. Can also strip formatting from clipboard text. Many special keywords like for example lock computer, restart, shutdown, standby, turn off monitor(s), mute sound, show date/time/week number etc. Import/Export keywords (import can also import directly from an url rather than a file). 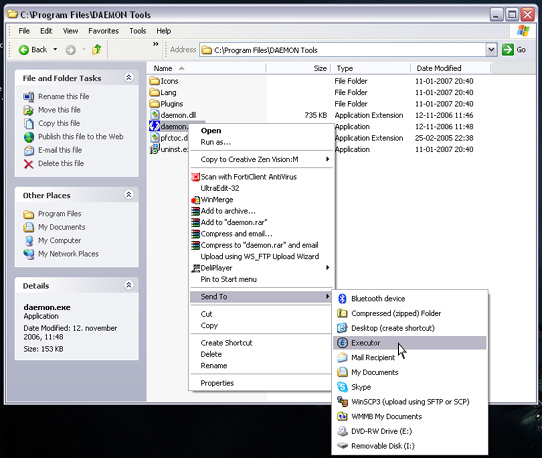 Integrated Windows context-menu (for example when right-clicking list items). 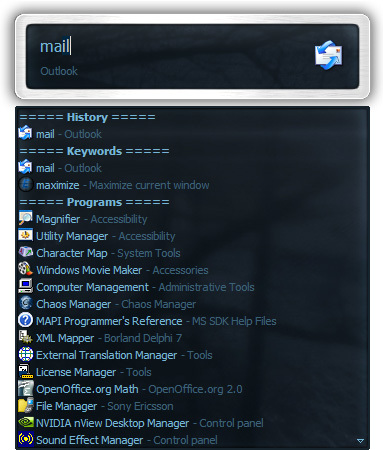 At startup a number of keywords/commands optionally be launched. Set simple a simple alarm, timer, stop-watch (with optional alert sound). Pressing enter with no valid input will launch first suggested item (optional). Be able to grab text from hidden launched console applications and display text in input or in multi-lined text. Several hidden experimental/minor settings to play with (Example show time/date/other stuff when idle). Fixed problem with opening settings/keywords window in older versions of Windows. Fixed $U$ to better support none ascii characters. 547 1,304 Martin Bresson <img src="https://www.oldergeeks.com/downloads/gallery/thumbs/Executor1_th.png"border="0"> Oct 11, 2018 - 09:42 0.99.23b 2.05MB EXE , out of 2 Votes.